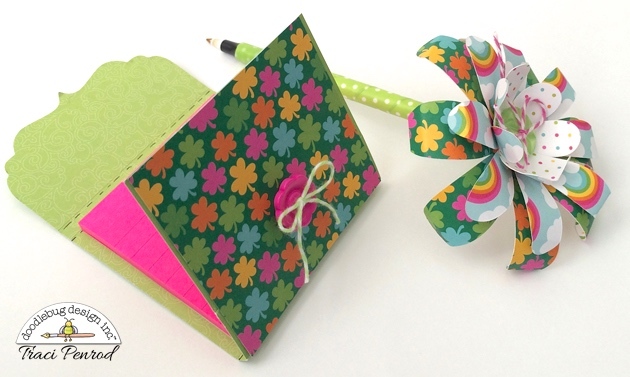 To start, I used white card stock and "Happy-Go-Lucky" pattern paper to create a small gift box. I used a cutting file by Alaa'K and tied ribbon through the holes in the corners. I love Doodlebug's cards so I used two of them in my project. I used the limeade A6 swiss dot card and for my sticky note holder I used the limeade slim filigree card. For the pen, I wrapped limeade swiss dot washi tape around the pen and cut and layered flowers out of pattern paper for the top. A cute limeade boutique button and bubblegum twine finished off the pen. What's a gift without a bit of chocolate right? So I wrapped 1" pattern paper strips around chocolate nugget candies and tucked them into a bubblegum striped treat bag. In addition to the products I mentioned, I also used the "Happy-Go-Lucky" icon and fancy frill stickers, bubblegum twine, limeade twine, and sprinkles. Please visit my blog for a quick and easy tutorial on scoring and cutting Doodlebug's filigree card to make the sticky note folder. So fun Traci!!!! I love the pen!! LOVE IT ALL, especially your flower topped pen!!! How could anyone not ADORE this collection - I think it is has the BEST Doodlebug Design collection OF ALL TIME!!! Love this, so super cute!!!! I love it!!! I want to be your teacher Traci!!! Specially the flower, awwwww!! So in love with how cool and super cute, and very awesome this set is!!!! 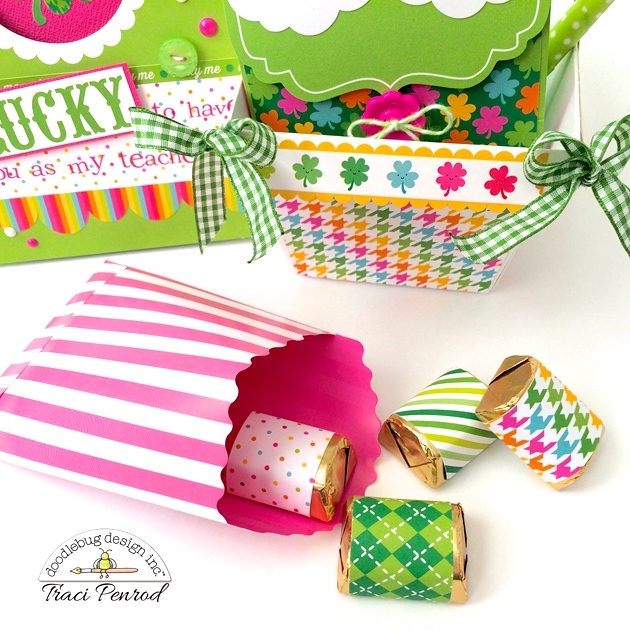 So impressed by the way you have used the happy go lucky collection in such fun and happy ways!! That little rainbow handle on your post-it note holder - GENIUS idea!! The whole thing is just awesome beyond compare!!! Love it!!! Such a fun gift set for a Lucky Teacher!